This just squirrels away the callback used to run any analyses and register their results. 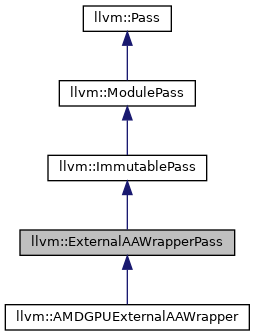 Definition at line 1170 of file AliasAnalysis.h. Definition at line 1171 of file AliasAnalysis.h. Definition at line 1177 of file AliasAnalysis.h. Definition at line 1181 of file AliasAnalysis.h. Definition at line 1186 of file AliasAnalysis.h. 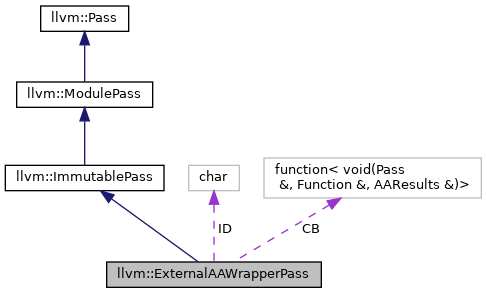 References llvm::createAAResultsWrapperPass(), llvm::createExternalAAWrapperPass(), llvm::createLegacyPMAAResults(), F(), function, llvm::getAAResultsAnalysisUsage(), P, and llvm::AnalysisUsage::setPreservesAll(). Definition at line 1173 of file AliasAnalysis.h. Definition at line 1175 of file AliasAnalysis.h.